In concert with yesterday’s article here on Jimmy’s Daily Planet that focused on Steven Spielberg’s thoughts regarding the necessity for all Oscar-eligible films to remain within the traditional parameters of a traditional theatrical release, the Academy of Motion Picture and Arts and Sciences has determined that Rule Two — which involves a film’s eligibility for winning — will favor streaming services moving forward in so many words. The Academy’s Board of Governors voted to maintain Rule Two, Eligibility for the 92nd Oscars. The rule states that to be eligible for awards consideration, a film must have a minimum seven-day theatrical run in a Los Angeles County commercial theater, with at least three screenings per day for paid admission. Motion pictures released in nontheatrical media on or after the first day of their Los Angeles County theatrical qualifying run remain eligible. The argument is not about quality — which ‘Roma’ has — but more about quality of experience. I am a fan of Netflix. It’s a great service for TV and film. But let’s face facts that most people multi-task (or are at least tempted to) with convenient streaming services like Netflix that very easily takes away from the pure movie watching experience. It’s also crucial that Hollywood ensures that all eligible films are having to play by the same rules for the same grand, life-changing prize. As Mr. Spielberg noted yesterday in the New York Times, the theatrical experience must be maintained for the biggest movies of the year. He is 100% right. The Academy’s progressive move towards the “future of TV” is a slippery slope that will exert pain on movie theaters in big cities and small towns alike in the short and long term. Academy President John Bailey expressed sympathy for the theatrical experience yet fell short with a sanitized non-answer answer for his conclusion. In other words, Mr. Bailey supports counting the dollar bills from streaming services. Are we on our couch watching a summer blockbuster on our TV or cell phone or laptop? Or are we in a dark, crowded movie theater with strangers for an unforgettable movie experience that simultaneously defines our lives and popular culture with cinematic game-changers like ‘Jaws,’ ‘Star Wars,’ ‘Jurassic Park’ and ‘Inception’? It costs a lot of money to invest, produce and ultimately release a major motion picture. Creating short cuts in this process will cut short what movies mean for us and movie studios moving forward. Netflix contributed to the downfall of the Blockbuster movie store chain early in the 21st century, transforming the origin of the movie watching experience at home from an excitingly extroverted in-store search and interaction to the introverted in-house mail service. Now it seems the Academy and streaming services like Netflix have its eyes on revolutionizing the summer blockbuster by way of the information superhighway. When it comes to the Academy of Motion Picture and Arts and Sciences debating issues like Rule Two, movie theaters are gonna need a bigger vote. Steven Spielberg has received criticism for comments he made related to Netflix and how films on the popular streaming service should not being eligible for an Academy Award. While the legendary director did not need to clarify because he is correct (this writer’s opinion), the Academy Award winner just added some clarity on the ever-relevant issue for films in this technologically evolving era through the New York Times. As covered on Jimmy’s Daily Planet, Mr. Spielberg recently embraced the future of Apple via Apple TV+ as a directorial partner and storyteller. The more movies by Spielberg, the better. What’s equally important is that he has stated in the past how impressed he is with the quality of TV these days. And what’s most important for movie fans to hear — with Netflix, Hulu, Amazon Prime Video — are the last three sentences of Mr. Spielberg’s statement above, with particular emphasis on the final two sentences. Steven Spielberg — the man who brought the late Michael Crichton’s dino DNA to the big screen in innovative, entertaining fashion like the world had never seen before — is pragmatically nostalgic for the days when seeing a movie in a dark theater was a major public event on Friday and Saturday nights. There are a time and a place for watching TV shows and movies at home. And there are a time and a place for watching a summer blockbuster in a movie theater near you. 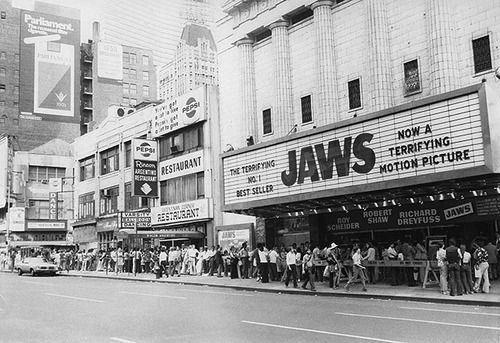 44 years after Spielberg’s ‘Jaws’ became the first summer blockbuster and the movie theater in 2019 is still the only place where a film is projected larger than life.